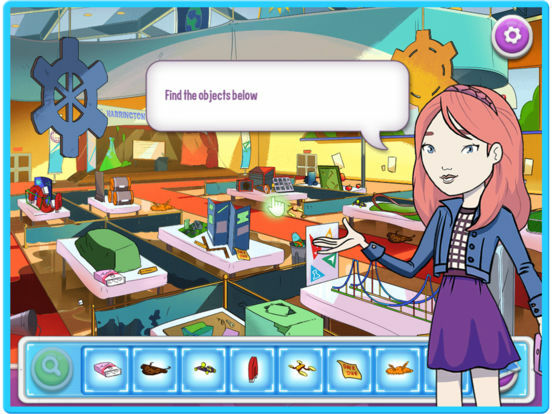 Nancy Drew: Codes & Clues is an interactive, point-and-tap adventure game that teaches basic coding skills. Codes & Clues for iOS and Android begins with Nancy and her friends Bess and George traveling to the Tech Fair at Harrington Prep, where they’re entering their project, a robot puppy that they’ve programmed. After meeting the participant at the table next to them, they soon discover that her project, a dog treat delivery system, has gone missing. It’s been sabotaged, and clues are everywhere. At the start of each of the six chapters, you get to choose between four “disguises,” or fashion-sensible outfits, for Nancy, Bess, and George. Then, players follow the voice-acted investigation and complete different challenges. Most of these are hidden-object puzzles, where you have to find certain objects in the environment, some of which are clues that push the mystery forward. 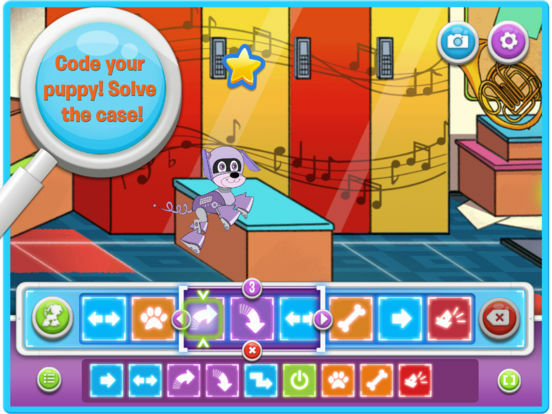 At the conclusion of each chapter, Nancy and her pals set their robot puppy to work, and this is where players learn coding language such as “commands,” “loops,” and “sequences.” Programming correct commands will move the puppy forward, allow him to bypass obstacles, and collect up to three stars—a way to measure how well you performed. Throughout the adventure, you can also earn “charms” (basically, badges or achievements) for different accomplishments. The entire game only takes about two hours to finish and is rather repetitious, sticking almost completely to the same formula of multiple hidden-object puzzles and then a coding sequence at the end. Unfortunately, the game offers very little in the way of teaching coding. It focuses more on hidden-object puzzles than coding challenges (over 20 as opposed to six, respectively), and although it offers players more commands to choose from as the game goes on—the robot puppy can jump up, jump down, turn around, crawl, and later hover up, hover down, bark, kick objects, and more—this adds little difficulty to the puzzles. The game “boops” when you entered a command that the puppy wasn’t able to execute, but that’s about it. I never made use of several of the commands, and since you can input a few commands at a time rather than a longer sequence, as well as easily correct mistakes without starting over or losing progress, there’s no real complexity or pressure to improve your skills. Codes & Clues teaches looping, for example, but you don’t even need to make use of this feature to succeed. The puzzles would have benefitted from certain objectives, such as “use a loop two times” or “complete the challenge without any errors.” This is one instance where players have too much freedom and too little feedback. Codes & Clues only costs $4 per copy, and it can be a good way to introduce young children to the fundamentals of coding—but it never takes the learning beyond that first step. And since the game offers minimal feedback to students, teachers will need to monitor progress closely and encourage students to reflect on how they could have approached executing a sequence differently (such as using loops instead of entering individual commands). Nancy Drew: Codes & Clues is cute, with voice-acting and a fun mystery story, but its repetition limits how stimulating it can be for kids. The only silver lining is that Nancy and her friends are as enthusiastic about coding and tech as they are about outfits and puppies. At the young ages that the game is geared for, encouraging girls to find tech cool is as much a worthy endeavor as teaching them to code.